No haunted house or cemetery is complete without a Crazy Bonez Werewolf Skeleton! This full sized skeleton prop stands 64 tall and features realistic molded bones and faux hair detail along the shoulders, neck and skull. This is an exclusive version of the white bone colored werewolf and is made in a brown/rust color with matching fur. Just like the original Crazy Bonez life size Pose-N-Stay skeleton, the werewolf has posable limbs with knees that lock into place to hold a position. It will stand erect against a wall or object but cannot stand freely. 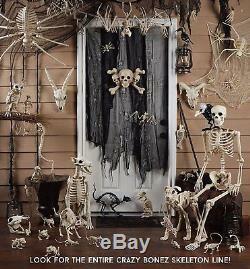 Stands 64 tall - Crafted from durable all-weather plastic with faux hair detail - Posable limbs with knees that lock into place to hold a position - Part of the original Crazy Bonez Skeleton line - Spooky addition to any Halloween scene or decoration. Crazy Bonez Werewolf Pose-N-Stay Skeleton, Brown. The item "Crazy Bonez Werewolf Pose-N-Stay Skeleton, Brown" is in sale since Tuesday, June 5, 2018. This item is in the category "Collectibles\Holiday & Seasonal\Halloween\Current (1991-Now)\Decorations\Other Current Halloween Décor". The seller is "elenor-liam" and is located in US. This item can be shipped to United States.